Considered by many to be one of the most luxurious condo towers in all of Atlanta, the Loews Hotel Residences Atlanta offer a lavish living experience unlike anywhere else in town. A collection of 52 luxury condo residences that sit atop the Loews Hotel, the Loews Hotel Residences feature ultra high end interior finishes, sprawling views of Midtown and the surrounding cityscape, and just a comfortable, elegant, and sophisticated atmosphere that makes living here an absolute delight. More details about what to expect from condos inside the Loews Hotel Atlanta are outlined below, but to start your luxury condo search at the one-and-only Loews Hotel Residences, simply click on the “Listings” link you see above or below. 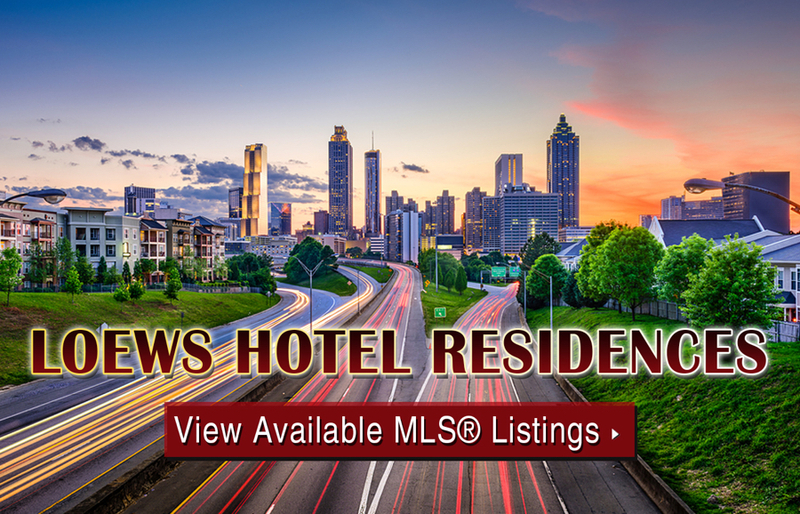 And if you’d like more information about Loews Hotel Residences condos for sale in Atlanta, call us today at (404) 564-7272, or click below to start browsing active listings at this amazing Midtown condo development. The Loews Hotel Residences Atlanta are located at 1065 Peachtree Street, which means you’ll be living right in the heart of the vibrant Midtown neighborhood. Some of Atlanta’s top restaurants, bars, entertainment venues, and luxury shopping destinations are only minutes from the front lobby doors at the Loews Hotel Residences, and downtown Atlanta is only about a 15 minute drive from the building as well. For a closer look at what’s near the Loews Hotel Residences Atlanta, check out the map below or call or text us today to schedule a private tour of the building and any of its available units. Can’t find what you’re looking for at Loews Hotel Residences (1065 Midtown)? Start browsing other Midtown real estate for sale or give the Zac Team a call at (404) 564-7272 for help with your new home or condo search today!